A monosaccharide is the most basic form of carbohydrates. Monosaccharides can by combined through glycosidic bonds to form larger carbohydrates, known as oligosaccharides or polysaccharides. An oligosaccharide with only two monosaccharides is known as a disaccharide. When more than 20 monosaccharides are combined with glycosidic bonds, a oligosaccharide becomes a polysaccharide. Some polysaccharides, like cellulose, contain thousands of monosaccharides. A monosaccharide is a type of monomer, or molecule that can combine with like molecules to create a larger polymer. Monosaccharides have many functions within cells. First and foremost, monosaccharides are used to produce and store energy. Most organisms create energy by breaking down the monosaccharide glucose, and harvesting the energy released from the bonds. Other monosaccharides are used to form long fibers, which can be used as a form of cellular structure. Plants create cellulose to serve this function, while some bacteria can produce a similar cell wall from slightly different polysaccharides. Even animal cells surround themselves with a complex matrix of polysaccharides, all made from smaller monosaccharides. All monosaccharides have the same general formula of (CH2O)n, which designates a central carbon molecule bonded to two hydrogens and one oxygen. The oxygen will also bond to a hydrogen, creating a hydroxyl group. Because carbon can form 4 bonds, several of these carbon molecules can bond together. One of the carbons in the chain will form a double bond with an oxygen, which is called a carbonyl group. If this carbonyl occurs at the end of the chain, the monosaccharide is in the aldose family. 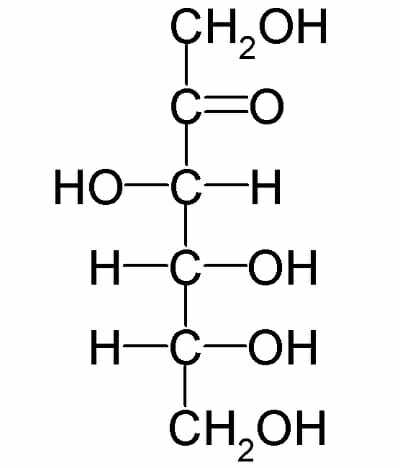 If the carboxyl group is in the middle of the chain, the monosaccharide is in the ketose family. Above is a picture of glucose. Glucose is one of the most common monosaccharides in nature, used by nearly every form of life. This simple monosaccharide is composed of 6 carbons, each labeled in the image. The first carbon is the carbonyl group. Because it is at the end of the molecule, glucose is in the aldose family. Typically, monosaccharides with more than 5 carbons exist as rings in solutions of water. The hydroxyl group on the fifth carbon will react with the first carbon. The hydroxyl group gives up its hydrogen atom when it forms a bond with the first carbon. The double bonded oxygen on the first carbon bonds with a new hydrogen when the second bond with the carbon is broken. This forms a fully connected and stable ring of carbons. Glucose is an important monosaccharide in that it provides both energy and structure to many organism. Glucose molecules can be broken down in glycolysis, providing energy and precursors for cellular respiration. If a cell does not need any more energy at the moment, glucose can be stored by combining it with other monosaccharides. Plants store these long chains as starch, which can be disassembled and used as energy later. Animals store chains of glucose in the polysaccharide glyocogen, which can store a lot of energy. Glucose can also be connected in long strings of monosaccharides to form polysaccharides that resemble fibers. Plants typically produce this as cellulose. Cellulose is one of the most abundant molecules on the planet, and if we could weigh all of it at once it would weigh millions of tons. Each plant uses cellulose to surround each cell, creating rigid cell walls that help the plants stand tall and remain turgid. Without the ability of monosaccharides to combine into these long chains, plants would be flat and squishy. Notice that instead of the carbonyl group being at the end of the molecule, as in glucose, it is the second carbon down. This makes fructose a ketose, instead of an aldose. Like glucose, fructose still has 6 carbons, each with a hydroxyl group attached. However, because the double bonded oxygen in fructose exists in a different place, a slightly different shaped ring is formed. In nature, this makes a big difference in how the sugar is processed. Most reactions in cells are catalyzed by specific enzymes. Different shaped monosaccharides each need a specific enzyme to be broken down. Fructose, because it is a monosaccharide, can be combined with other monosaccharides to form oligosaccharides. A very common disaccharide made by plants is sucrose. Sucrose is one fructose molecule connected to a glucose molecule through a glycosidic bond. Galactose is a monosaccharide produced in many organisms, especially mammals. Mammals use galactose in milk, to give energy to their offspring. 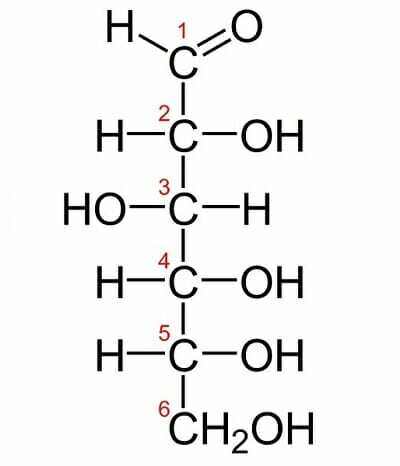 Galactose is combined with glucose to form the disaccharide lactose. The bonds in lactose hold a lot of energy, and special enzymes are created by newborn mammals to break these bonds apart. Once being weaned of their mother’s milk, the enzymes that break lactose down into glucose and galactose monosaccharides are lost. Humans, being the only mammal species that consumes milk in adulthood, has developed some interesting enzyme functions. In populations that drink a lot of milk, most adults are able to digest lactose most of their lives. In populations that do not drink milk after being weaned, lactose-intolerance afflicts nearly the whole population. Although the monosaccharides could be broken down individually, the molecule lactose can no longer be digested. The symptoms of lactose-intolerance (abdominal cramps and diarrhea) are caused by toxins produced by bacteria in the gut digesting the excess lactose. The toxins and excess nutrients they create raised the total amount of solutes in the intestines, making them retain more water to keep a stable pH. Disaccharide – Two monosaccharides connected by a glycosidic bond. Oligosaccharide – 3-20 monosaccharides connected by glycosidic bonds, typically used to move monosaccharides and store them for short times. Polysaccharide – Many (20+) monosaccharides, usually connected in long chains, used for storage or structural support. Carbohydrate – Sugars and starches, all made from monosaccharides. 1. Sucralose, a common artificial sweetener, is similar in shape to sucrose, a sugar produced by plants. However, instead of hydroxyl groups (OH) bonded to all the carbons, sucralose has some chlorine (Cl) atoms in its structure. Studies have shown that while the majority of the sucralose consumed passed through a person, 2-8% of it is metabolized. Why could this pose a problem for the person digesting the sucralose? A. It doesn’t provide as many calories as sucrose. B. Without the hydroxyl groups, the body cannot function. C. The body’s enzymes are not adapted to metabolizing sucralose. C is correct. The chlorine atoms in the sucralose molecule could present a serious problem to the body’s enzymes. Part of the mechanism that binds an enzyme to a substrate is the shape of the molecule. Once a reaction takes place, the products must be released. If sucrase, the enzyme that digests sucrose, is inhibited or damaged by the chlorine atoms, the enzyme may no longer function. While the body can produce more enzymes, if the amount of sucralose ingested overwhelms the body’s production of new enzyme, the person would no longer be able to digest sucrose. This could lead to nutritional deficiencies or other harmful side-effects. 2. An amino acid is a singular molecule that can be added in a chain to create a protein. An amino acid is not a carbohydrate. Which of the following terms describe an amino acids? A is correct. An amino acid is a single unit, which can be combined with other amino acids to create polymers of amino acids. This makes an individual amino acid a monomer. The term saccharide is another word for sugar. Since amino acids are not sugars, they are not monosaccharides. However, a monosaccharide is a monomer because it can form polysaccharide polymers when connected in series with other monosaccharides. 3. As mentioned, monosaccharides consisting of more than 5 carbons often tend to form rings in nature. The interaction that cause them to form rings are due to the forces of the polar water molecules acting on the monosaccharides. If monosaccharides are places in a non-polar solution, what will they form? B is correct. In a non-polar solution, no forces would be pulling the molecule inward on itself, and the non-polar regions of the molecule would form weak interactions with the solution. If a ring started to form, a source of hydrogen atoms would not be easy to find, as non-polar solutions often have few free ions for use. In water, many free hydrogen ions are available for creating bonds. Without these, and the forces produced by polar water molecules, the carbon skeleton would remain as a rigid linear molecule.